The obvious benefits of being a landlord and the advantages of buy to let are the reason so many people see property as a better alternative to a pension, giving them more control with an asset they could understand. Becoming a landlord however mostly meant buying near to where you lived which made the whole process a bit of a lottery – after all, we can’t all live in a property hotspot! This situation has been made more complicated by the steep rises in price that have occurred in London and the South East, not only taking buy to let property beyond the reach of all but the very wealthy, but also driving down yields to often unattractive levels. The good news is that the market is evolving fast with many investors waking up to the fact that buy to let property can best be described as ‘income producing units’ with the higher the yield the better. Actually we are currently in a once in a lifetime era where we can borrow at such a low rate that the income from rent can produce an amazing geared return provided the yield is high enough. This has meant for many the need to look further afield than their back yard, often the best rental hotspots are far from London and the South East. The trouble is that most people lack the time, confidence and contacts to go out and research, analyse and evaluate propositions all over the country, but we do and this is how our comprehensive end to end property investment service started to evolve. We are now in a position to source the best rental properties for our clients nationwide and to create for them high performing hands free investments which we manage on their behalf with one central point of contact and the peace of mind of our unique primary tenancy rent guarantee. Our comprehensive nationwide management service is not just available to our Investments clients, it’s also available for any landlord with properties in multiple locations who is looking to streamline their management and get more time to focus on enjoying their investments not managing them. It is also true that as the private rental market expands, landlords are faced with ever increasing legislation, regulations and obligations. One of the key benefits a good agent offers its landlords is to simplify the process of letting your property and ensure you comply with all the rules. 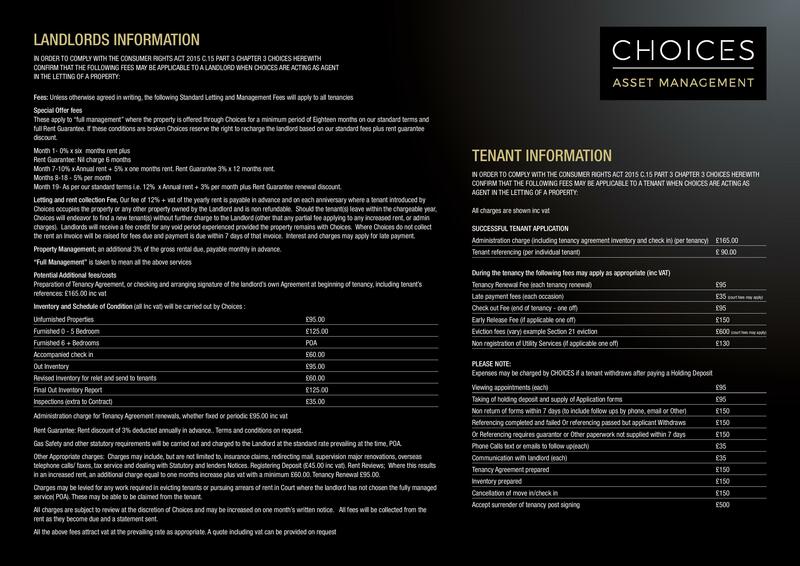 With our Primary Tenancy™, Choices goes one step further and offers landlords the ultimate in simplicity and peace of mind. Instead of acting just as your agent, with a Primary Tenancy™ Choices becomes your tenant and we sublet your property for a profit rather than a commission. By becoming your tenant we are providing you, our Landlord, with more privacy, protection and peace of mind. For example we are not obliged to hand your contact details to our sub tenants and in the event of a problem with our sub tenants we can undertake enforcement action against them without your involvement. Even better we offer this option at no cost to you! As part of our normal terms and conditions we arrange a three month rent protection and legal expenses guarantee. Payment of the premium commences cover for that tenancy, renewal premiums will be charged automatically annually without notice and termination will require notice in writing – a minimum of one month before renewal. This would repay up to three months lost rent, plus the cost of legal expenses (currently up to £1,000) incurred in the process of evicting the tenant and protects the deposit in full for claims of dilapidations and repairs. A copy of the terms of the rent guarantee is in this pack and please read the terms carefully. This is highly recommended and if you examine the cost of, say, a property with rent of £1,000pcm, the cost of a rent guarantee is £360.00 per annum including vat. Technically you could then claim for up to £3,000 in rental arrears, plus up to £1,000 in legal costs and still have the deposit of £1,500 available for any dilapidations caused, worth therefore up to £5,500. We realize that many landlords who let privately, or who go through bad agents, often get themselves into appalling situations. Very often they turn to local solicitors who charge exorbitant fees and who themselves lack the experience to get the job done efficiently. Even if you have the money to sort it out, removing your tenants can be a costly stressful business but if you are short of money it can be much, much worse. We hear of landlords all the time without the cash to pay solicitors fees, or even if they do, they don’t have the cash to put their property back into let-able condition. Even, assuming you have evicted your problem tenants and paid for repairs, you are still faced with finding new tenants and what is to stop the whole business starting all over again? No wonder so many landlords get disheartened and sell their properties, ending their dreams of financial freedom and independence. It doesn’t have to be that way. With our help we can put you back on track. So whether you are interested in starting out and knowing how we can help you build a portfolio from scratch, or you are an established landlord looking for a better management solution, our nationwide management service is what you are looking for.